I was in Shenzhen for business trip and was free on the weekend, so I took a one day trip to Hong Kong just to explore around since I’ve never been there before. The trip was quite rush and only covered a few places. Took the subway from Shenzhen to Futian Checkpoint, then passed the immigration, took MRT from Lok Ma Chau straight to Tsim Sha Tsui. The whole journey including the waiting time at the immigration took almost 2 hours. Finally, that’s the first view I saw once reach there – the Victoria Harbor. Next, board on the ferry to go to Central. The ferry ticket cost $3.40 per trip from Tsim Sha Tsui to Central. First thing to do when reach Hong Kong is to get the Octopus card which can pay for all types of transportations, so that you don’t have to waste your time to buy tickets manually. Every Sunday is holiday for all Philipino maids, and the government allowed them to gather on the streets. This is what they do every Sunday, sitting on the streets, the pedestrian flyovers, the malls, everywhere. Several roads are closed purposely for them. The locals also took the opportunity to have talks and gathered on the streets as well. Went to a Starbucks coffee shop to have a break. This Starbucks are quite different from others, as the interior designed to be like the local old cafes. After the break, I walked to the famous Lan Kwai Fong street, where Hong Kong’s nightlife starts. Next stop, Shelley Street. Shelley Street is a street in Central, where it is a ladder street and the Central–Mid-levels escalators run along the entire length of the street. The lower part of the street is mainly entertainment area with a lot of shops, bars and restaurants while the top part are just residential area. I went up almost to the top but there was nothing much up there. Ended up walking back down because the escalator only goes up. 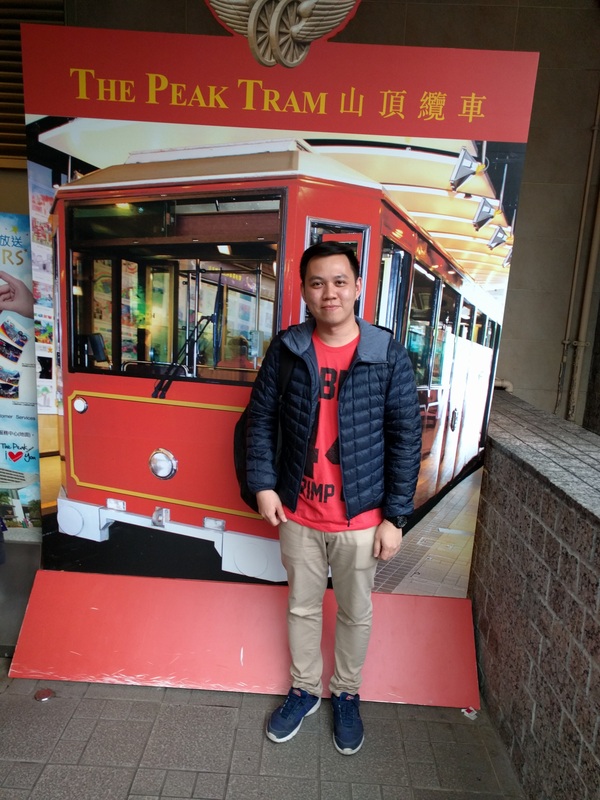 After coming down from the top, I went to the tram stop to wait for tram to Causeway Bay. It costs around $3.00 to take a tram to any places the tram goes to and it’s the cheapest public transport to get around. It was Sunday and the tram is full of passengers even on the upper level. Had to stand all the way through the journey. The view from the tram upper level was quite enjoyable. You can see the streets from a higher view rather than sitting in the MRT underground. The whole street was full with Philipino maids. After walking around the Timesquare area and had my lunch, it’s time to take a tram to go back to Central. My next stop is to go up to the Peak. 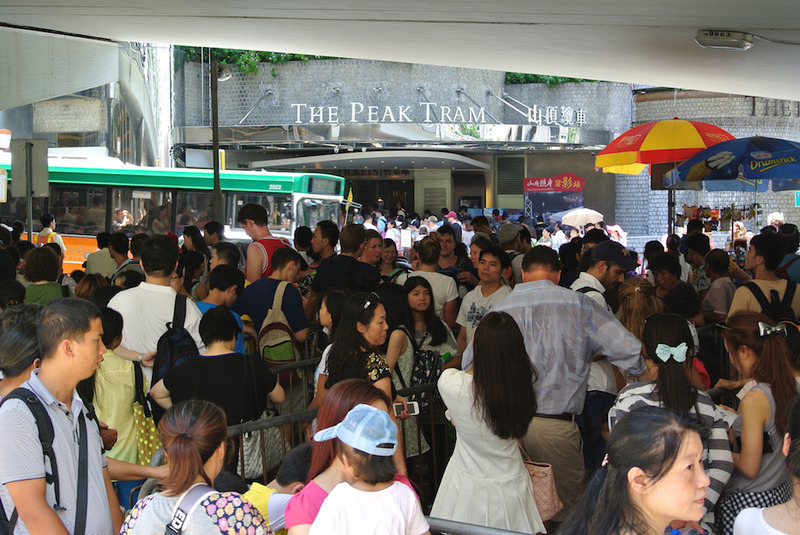 The queue to get to the tram going up the peak on weekends were crazy. I queued almost 2 hours just to get to the tram. You can see the queue started from the road opposite side of the entrance from the photo below. The workers forced helped all the tourists to take a photo with the tram. The view from the Peak is spectacular. Can see the whole Hong Kong island from here. The night view is even better. I reached the peak around 6:00pm and waited until 7:30pm for the sky to get dark enough for the night view. Then, it was rushing time! 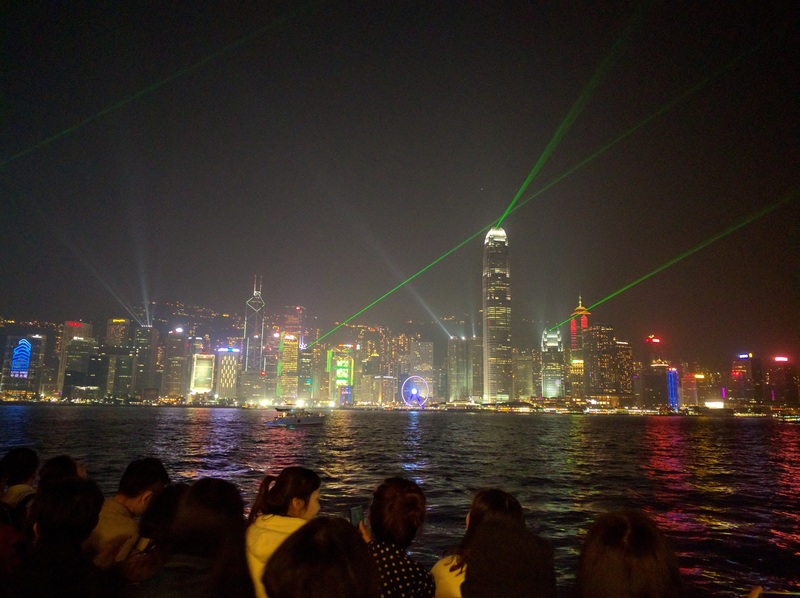 I need to get back to Victoria Harbor by 8pm for the “A Symphony of Lights” show which features the laser light show synchronized to music from over 40 buildings from the island. Once came down from the peak, I took the bus to the Central Pier, and took the ferry back to Tsim Sha Tsui again. The view from the ferry at night is awesome! Luckily once I reach the harbor, the show just started and I watched until the end. Make sure you stand near the stage or else you’ll be watching the show without hearing any music at all! After the long day it was time to go back to Shenzhen again. Was back in hotel after 2 long hours journey but it was a fruitful day!